Purbeck area of Dorset on a special cycling map at 1:46,500 from Heritage House highlighting 12 recommended cycle routes presented on the reverse with profiles, grading according to difficulty, etc. 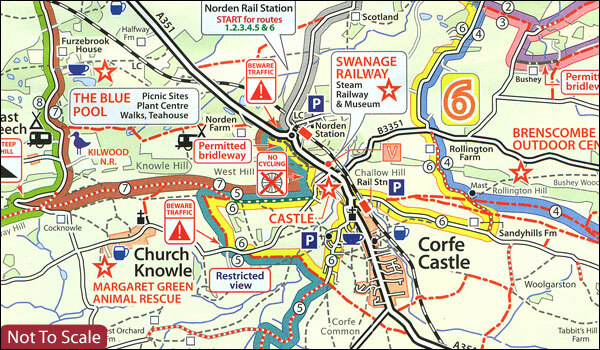 The map covers an area extending from the ferry linking Purbeck with Poole westwards beyond Lulworth Cove, and from the coast inland to Briantspuddle and Wareham Forest. Recommended cycle routes are highlighted and other markings indicate byways and bridleways, route numbers of the National Cycle Network, steep hills, danger points, etc. Also clearly marked is the Ministry of Defence Lulworth Ranges danger area. Symbols indicate camping and caravan sites, pubs and restaurants/tearooms, visitor centres, etc. British National Grid is indicated by margin ticks. On the reverse are details and brief descriptions of the 12 recommended cycle routes: distance and time, grading, suitability for children, plus a route profile.